Jumbo Sweet Onions are softer and sweeter than storage onions. Great for sandwiches, grilling, robust sauces and the perfect onion for homemade onions rings. Onions have been cultivated for over 6000 years. Store onions in a cool, dry well ventilated area. Cut onions may be covered and stored in the fridge for 2 - 3 days. Cut onions under cold water to wash away the sulfur that causes teary eyes. This product traveled 801 km to reach our warehouse. Storage Tip: Store in a dark, cool, well ventilated spot. If stored in plastic they will quickly rot. Preparation Tip: To prevent crying when cutting an onion, try putting it in the freezer for 10 minutes before beginning to chop. Did you know... Onions emit a gas that will cause potatoes to rot so don't store them together. Culinary Compatibility: Onions are good with almost any savoury companion. Health Information: A medium sized sweet onion contains 57 calories, while the same sized yellow onion contains 41 calories. Onions are a source of vitamin C, folate and potassium. 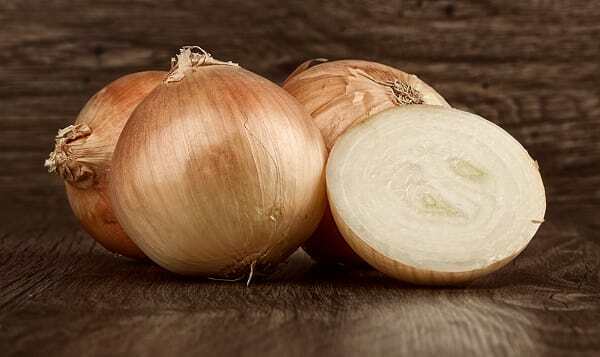 Onions have long been used as a folk remedy for coughs, colds, bronchitis and gastric infections.